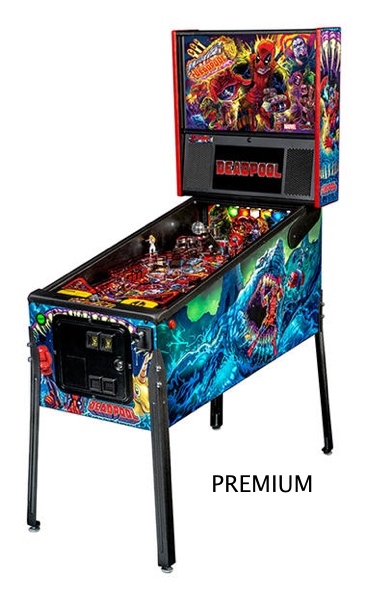 Stern Deadpool pinball machine for sale (UK Version) in Pro, Premium and Limited Edition models. 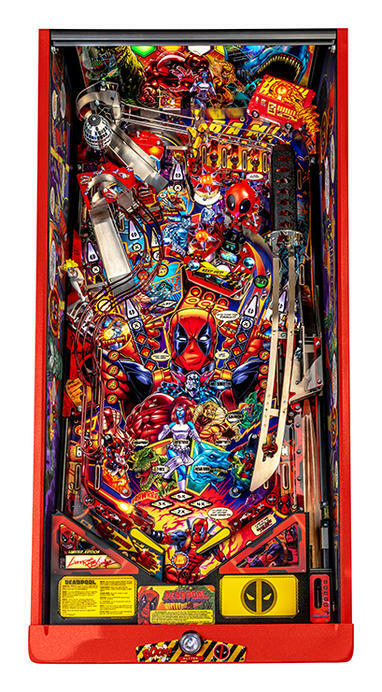 The Merc with a Mouth is getting the pinball treatment, with a new machine that features Wade Wilson as well as other iconic X-Men characters, like Wolverine, Dazzler, Domino, Colossus, Juggernaut, Sabretooth, Mystique, Sauron, and Mr. Sinister! 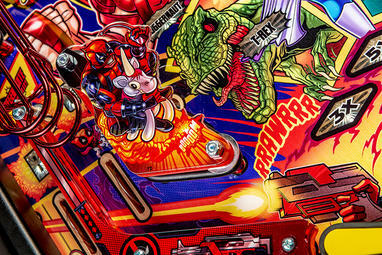 Available in Pro, Premium, and Limited Edition models, the Deadpool pinball machine will also allow players to travel via time machine to battle a T-Rex and Megalodon! 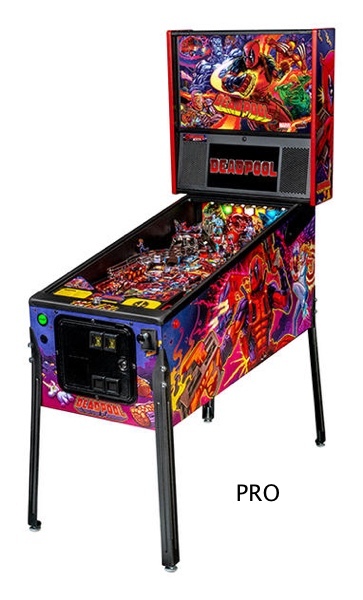 “Deadpool is one of Marvel’s most entertaining and unique characters ever created. 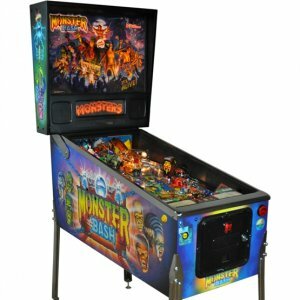 We feel his humor fits perfectly with pinball and creates a high energy and fun pinball experience,” said Gary Stern, Chairman and CEO of Stern Pinball, Inc. “Every property brings different challenges. 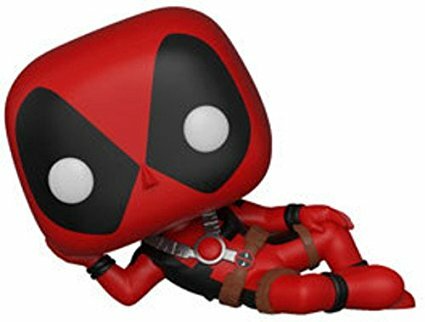 Deadpool has been great because it’s given us a lot of running room in terms of what we can do. 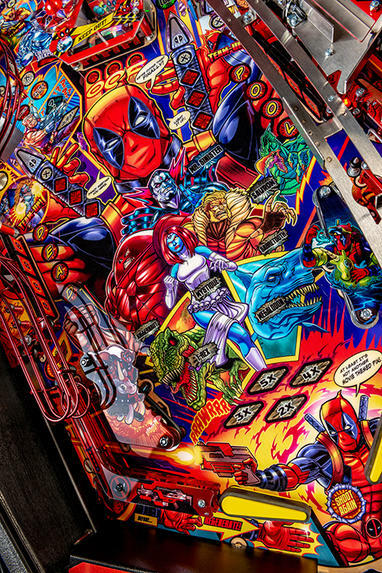 We’ve taken the approach that we’re going to make all these screen graphics look like the 80s or 90s video game graphics, purposefully very pixelated,” explains George Gomez, Stern Pinball Chief Creative Officer and Lead Designer of the Deadpool machine. “The other cool thing is when he breaks the fourth wall to talk to the player, to taunt and insult them, it’s going to be a high-res Deadpool. Imagine that the action on screen, If he’s in a horrendous fight against a bunch of ninjas, everything will freeze frame. 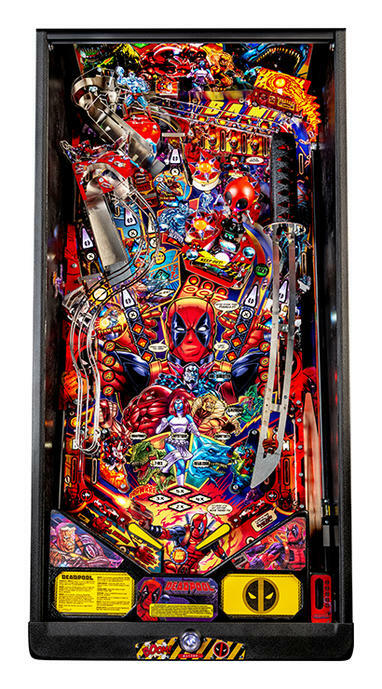 Deadpool will come out on screen and say something to the player, in Deadpool fashion.” Tanio Klyce, Lead Programmer for the Deadpool machine, explains more: “The biggest adventure we’re going on is making a very humorous and talkative pinball machine and capturing the personality of Deadpool in the machine.” With hand-drawn art by Zombie Yeti and the voice of Wade Wilson brought to life by actor Nolan North, players will interact with Lil’ Deadpool, katanas, and an amazing array of ninjas, vampires, and chimichangas throughout the game. 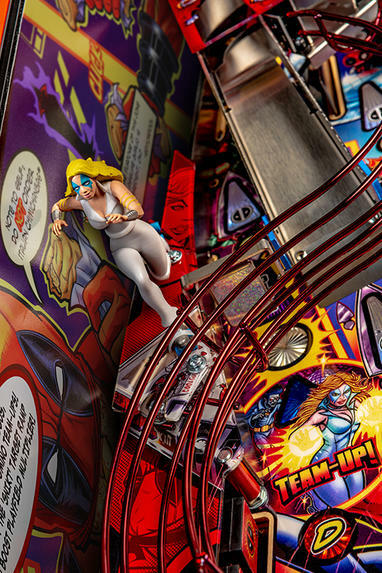 The Premium and Limited Edition models feature a disco ball with disco illumination effects, custom molded Wolverine and Dazzler action figures, and with a custom molded chimichanga truck time machine! 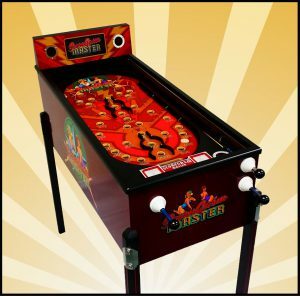 These models also feature an actuated up/down ramp that feeds the right flipper from the left orbit, which keeps the game moving about as fast as Deadpool’s mouth. “Because we’ve had so much freedom in this,” notes Gomez, “We have all original music, which is really cool. It has allowed us to write tunes that have a different vibe and feeling depending on what’s going on in Deadpool’s world.” That freedom gives fans an extra special bonus as all Premium models will include a custom “Deadpool’s Mix Tape” cassette featuring 11 original music tracks with sleeve art by Zombie Yeti.